The stamped concrete floor allows you to give free rein to your creativity: it is designed, coloured and stamped to recreate the effect of stone slabs, bricks, cobblestones and many other materials such as rock, ceramic and wood. 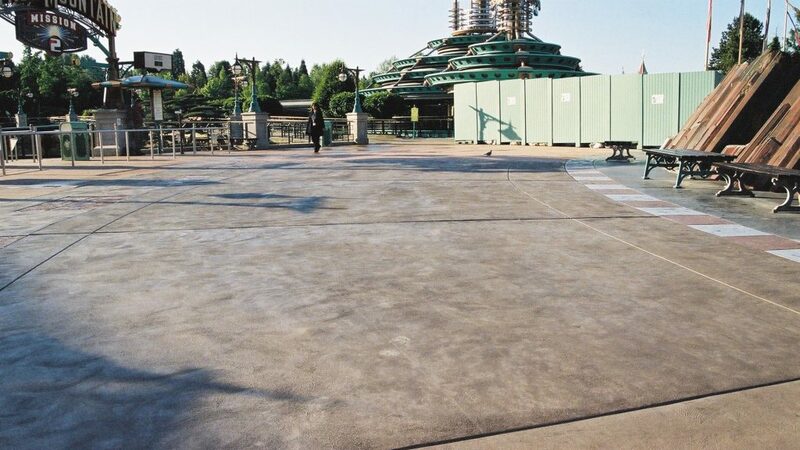 Unlike other more traditional outdoor concrete floorings, the stamped concrete can be decorated and finished in the shape and the colour, it withstands heavy loads and, if treated with specific resins and colour hardeners, it becomes extremely wear- and abrasion-resistant compared to the traditional concrete flatwork. It consists of a monolithic slab, and is therefore not subject to indentations or settlement. This solution’s features are fully preserved over time, proving it to be a durable, wear-resistant surface coating, suitable even to high vehicular traffic. This coating solution is extremely adaptable and therefore perfect for both indoor and outdoor renovations of small or big surfaces. Its price and implementation costs are easy to define compared to interlocking or natural stone finishes, because the screed and the finishing are created in a single step and therefore there’s no need to add to the final price the cost of ancillary elements such as kerbs, pits etc. Ideal Work solutions give external hardscapes a unique look! Being suitable for vehicular traffic, the stamped concrete’s thickness is extremely variable; it will be defined according to the loads the flatwork will have to withstand. The possibility to decide the thickness according to the use for which the flatwork is intended, makes it suitable for heavy vehicle traffic areas such as access ramps, streets and driveways. Thanks to some specific protective treatments, the surface can also become mould-, dust- and absorption-repellent, making the cleaning operations easy for driveways, access ramps, garages, areas that are usually subject to oil stains and vehicles transit traces. You can renovate your existing external floor by simply covering it with stamped concrete to obtain a unique look in a short time; in fact, according to the season and the construction site conditions, our applicators are able to create 200 sq of stamped concrete flatwork in just 4-5 days. Given its stain-repellence, the stamped concrete floor proves to be particularly suitable for indoor surfaces too, such as basements, access ramps, porches and garages; spaces that are subject to moisture or stains (engine oil or food and drinks). Thanks to Ideal Work protective treatments these surfaces will no longer be at risk of stains. However, even though the protective resin isolates the floor surface, it is recommended to immediately remove the stains. The stamped concrete solutions can be customized in many different ways. Ideal Work offers a wide range of colours, shades and shapes the client can choose from. With specific floor moulds you can reproduce the typical effect of stone walkways, of rock slabs and of wood; also, it is possible to create a pattern with geometrical shapes. 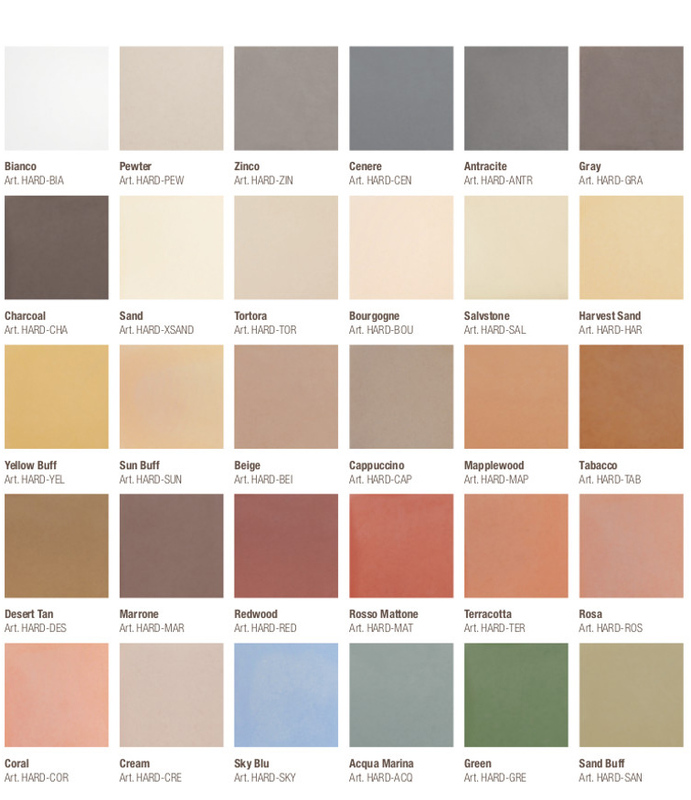 The available colours vary from ash grey to brick red, from sky blue to pink; they remain unchanged over time, guaranteeing a durable unique and modern style. As opposed to traditional concrete floorings, flat and monotonous, with the stamped concrete coatings you can choose your favourite pattern and texture amongst a wide range of possibilities. The colour choice is even wider. In the concrete colouring there are two main components: the Colour Hardener and the Liquid Release Agent. The Colour Hardener provides 29 standard colours for the concrete coloration; the Liquid Release Agent allows to blur and to define the blur on the floor surface. Considering all the possible matches between the standard and the blur colours, there are in total more than 500 possible combinations. 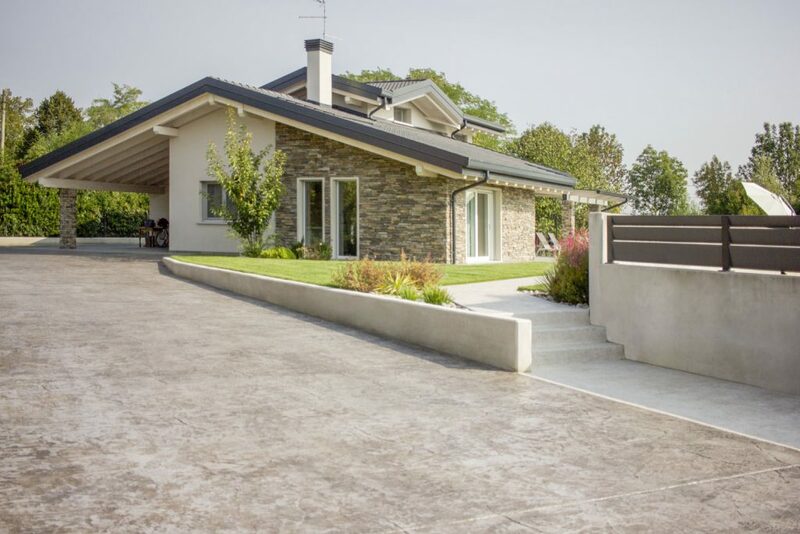 A fundamental feature of the concrete colouring is its long-lasting resistance: thanks to the application of a very effective protective resin, the colour doesn’t fade; neither with a prolonged exposure to sunlight, nor under the action of the UV rays. It’s important to clarify, however, that the concrete final colour doesn’t depend on the top resin; it depends on the concrete coloration during the mixing phase. As said before, this is a monolithic solution, created with a unique concrete slab; for this reason it’s necessary to cut the floor to insert some control joints that facilitate the concrete natural contractions and thus the creation of the dilatation joints. 2 – By creating some decorative motifs of circular shape, created by a series of flower elements diverging from the centre. They can come in many different patterns and colours. 3 – By creating some geometrical decorations, such as those of the Miragica theme park in Puglia, which cover a surface of more than 12000 sq and reproduce different spectacular effects for each theme zone. STAMPED FLOOR OR STAMPED CONCRETE? The stamped floor is a better solution for both its resistance (thanks to the protective treatments, in fact, it’s twice as wear- and abrasion-resistant as a regular concrete floor) and the installation time and price. It exceeds the classic concrete floors also from an esthetic point of view: besides the application of frames and decorative motifs, it is possible to create some particular decorative textures that would be otherwise impossible to create with the regular concrete. 1 – The protective resin treatment: it protects the floor from the sunlight and the UV rays exposition, plus it makes the floor mould-, dust- and absorption-resistant. 2 – The Power Release Agent application: a strenghtening agent that improves the floor’s abrasion- and wear-resistance. Do you want to cover an existing old and stained floor? With Ideal Work you can! A specialist will evaluate the intervention feasibility and decide whether or not to use the existing screed. In this case, the application of the stamped concrete will require a different procedure than the regular application. According to the screed size, the specialist will select the best technical option between TOPFLOOR, suitable for 1-2 cm thick floors, or BETONTOP, suitable for solutions with a thickness between 2 and 6 cm. In line with the other Ideal Work solutions, the stamped concrete floors can be applied both indoor and outdoor. This will allow you to maintain an esthetic continuity between the internal floor and the outdoor flatwork. If you would like your kitchen or living room floor to be the same as the external walkways or your house’s porch, or if you don’t want your driveway style to be any different from the garage’s, concrete coatings are ideal for you! Among the places that had successful results with Ideal Work products there are two of the greatest exponents of the theme park industry, welcoming more than 17 millions visitors every year: Disneyland Paris and Gardaland, in Peschiera del Garda. Ideal Work created a series of floors for Gardaland too. 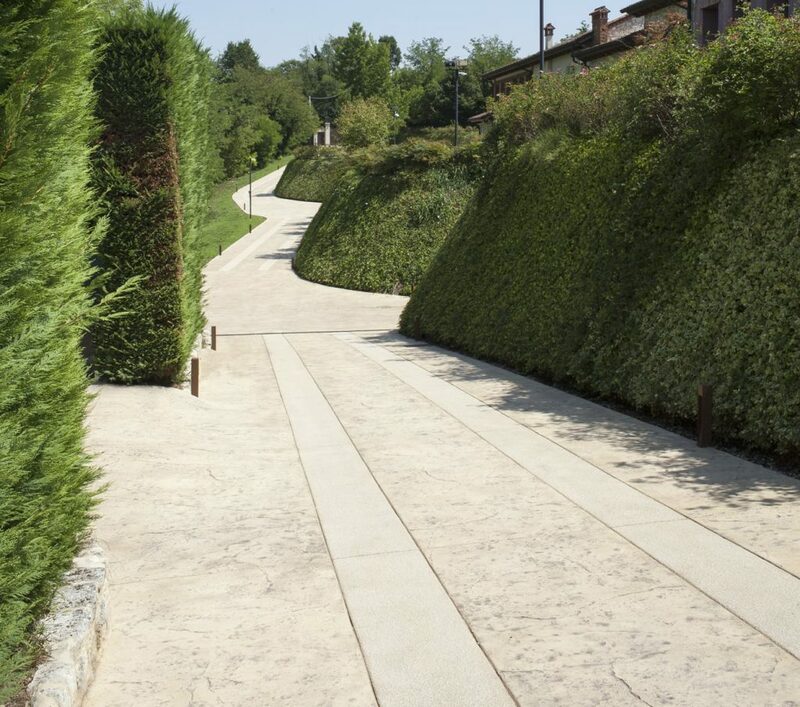 They were intended to reduce the park’s maintenance, a goal Ideal Work reached successfully: thanks to its intervention, the park managed to fix the indentations and settlements caused by the wear of the flatwork, to limit the damages of thermal shocks and to eliminate the annoying weeds growing between the single stones of their classic flooring. Ideal Work renovated the walkways, giving them a modern look that recreates the natural stone, the wood, the rock and the ceramic effects. In 2016 Ideal Work accepted the challenge of creating the walkways of Europe’s biggest theme park; they had to match the magic of the scenography and at the same time be suitable to such a heavy foot traffic. 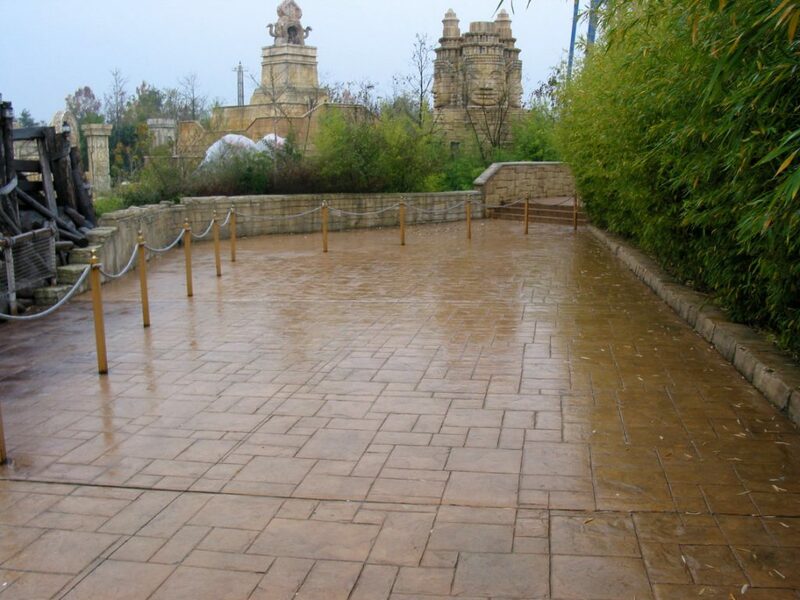 Ideal Work created different types of stamped floors, suitable for the theme park setting. In detail, the floors recreated the refinement of ceramic effect, the timeless brick effect and the elegance of the wood effect.